Born 1968, and lives in Santa Fe, New Mexico. Ron Rodriquez is the grandson of Felipe Archuleta and the nephew of Leroy Archuleta. He grew up in a family with carving tradition helping at the workshop located in Tesuque, New Mexico. If his family carved religious sculpture, he would have be known as a Santos carver. He makes rattlesnakes from bottle caps strung on wire then painted with indigenous wood heads and rattles. Like his grandfather and his uncle he is best known for his carved wood reptiles and animals. When we lived in Santa Fe during the late 1970's and 1980's we became very enamored with a petite gallery operated by Davis Mather. He represented the Archuleta's and later Ron Rodriquez. Our trips to the post office led us past the gallery almost daily. We recall a period of nearly a summer when the window display consisted of a large black and white sow and her five piglets carved and painted by Felipe Archuleta. Davis Mather also had carved and painted fish, and snakes, ... the pigs were our favorite, coveted even today. We returned in 1989 for a vacation. Intent on hiking and gallery hopping we had driven our Volvo wagon west. The gallery was thriving! He had large harnessed black bears, some nearly life size. The torch had been passed, most of the work in the gallery was now carved in the family tradition but now by Ron Rodriquez. 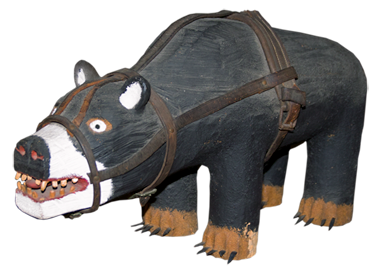 We selected a harnessed bear which fit in our wagon. Our dog Amelia gladly shared space with it and other treasures we discovered during our journey.